Let’s first go forward to verses 14 & 15 in the Epistle of Jude, to his reference to a prophecy given by Enoch prior to the Great Flood event. way, and of all the harsh things which ungodly sinners have spoken against Him." As you can see, Jude captures the implied meaning of Enoch 1.9 and makes it a more explicit statement. and will prosper and be blessed, and the light of God will shine on them. 1.9 And behold! He comes with ten thousand Holy Ones; to execute judgment upon them and to destroy the impious, and to contend with all flesh concerning everything that the sinners and the impious have done and wrought against Him. Now, let’s put the two statements, Jude and Enoch, together on one slide in order to make a direct comparison of them. And behold! He comes with ten thousand Holy Ones; to execute judgment upon them and to destroy the impious, and to contend with all flesh concerning everything that the sinners and the impious have done and wrought against Him. Now, we’ll take a closer look at two words from the NKJ translation that need clarification. these dreamers- One possibility is that they relied on their dreams, and by trusting in them for guidance, they were easily led astray. This is the same as following subjective experiences that have not been tested whether from God or otherwise. Failing to make such tests often lead many into disobeying God’s written Word. of dignitaries- The implication that this is a reference to leaders in the church or community needs to be taken up a notch or a hundred. The Greek word is “glorious ones,” and refers in this context to angelic beings in the abstract; that is, glorious entities in heaven in general, including angels, the Godhead Trinity, and God’s heavenly consul. According to a highly capable commentator on this Epistle, Joseph Mayor, the immediate reference is to angelic beings, whom these false teachers had been blaspheming directly; and by doing so were blaspheming God indirectly; because they had been perpetrating the false doctrine that the angels had created the world, and that, in opposition to the will of the true God. The following verses then point out the brazenness of these blaspheming spiritual spies who were active at both defiling the physical and the spiritual authority of God’s consecrated order on earth. 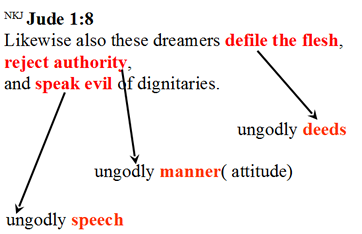 So, here is a comprehensive translation of Jude verse 8. In the same manner [CH-amazingly], in spite of the common knowledge that they knew about the fate of the three groups just mentioned, these dreaming-like characters acting in their own self-interest [middle], seemingly oblivious to God’s truth, on one hand, are continually defiling flesh in the abstract and in its various forms, and on the other hand, they habitually despise lordship authority in the abstract and in its various forms, and furthermore they press on in their blasphemy, speaking evil things about angelic beings in the abstract, including glorious entities of heaven and the glory of the true God. Yet Michael the archangel, in contending with the devil, when he disputed about the body of Moses [ref. ], dared not bring against him a reviling accusation, but said, "The Lord rebuke you!" This event is not in the OT, and whatever story Jude is referring to has been lost to history. At any rate, Michael knew not to pronounce a sentence of condemnation on the devil, but to leave that to Christ’s authority. 4 So Moses the servant of the LORD died there in the land of Moab, according to the word of the LORD. 5 And He buried him in a valley in the land of Moab, opposite Beth Peor; but no one knows his grave to this day. But [CH-amazingly] these guys, on one hand, habitually blaspheme (speech) against those things of which they have absolutely no Holy Spirit-given spiritual insight, but [CH-more amazingly] in the manner (manner) of animals without rationality, the things of which they understand in their own ability [middle] by natural instinct, by these things ruin comes upon them (deed). great crowd, and Korah’s hostile rebellious greed has brought them to a fate of final ruin that is an already settled matter. Here is another 3-fold witness pertaining to one type of unrighteousness; namely that of greed. You might be wondering how the idea of greed could be the unifying motivational factor among these three biblical examples used by Jude. In a biblical sense, greed is defined by or characterized by one’s dissatisfaction with the place they occupied, and so they each engaged in rebellion against God in their individual ways, greedily seeking selfish gain at any cost.